Few things recharge and rejuvenate better than being in the outdoors. Whether you’re taking off for a quick weekend trip in the mountains or camping by a lake for a few days, you’ll need a bag that’s up for the challenge. Being away from the comfort of home is wonderful – unless the very bag carrying your belongings is unreliable, causing you unnecessary stress. Spending hours in the wilderness trekking to and from your destination should be invigorating but this just won’t be possible when your backpack is weighing you down. A bag that causes strain on your back and shoulders can easily ruin your trip before it even begins. After all, it would be difficult to enjoy your time in the outdoors when you’re suffering from pain as soon as you arrive. Not to mention the worry that comes with keeping your valuable belongings dry, especially if you’re traveling during unpredictable weather. Most of the gear you’re bringing along to stay comfortable on your trip may be rendered useless when exposed to rain: matches, sleeping bag, extra clothes, and food. Having said that, generous space in a camping backpack is important, too. You can never have too much space when you’re spending several days in the outdoors especially for camping enthusiasts who like to come prepared with everything you could possibly need. Whether you’re traveling in rough terrain or not, being far from home can already put you in a vulnerable position. The last thing you need is a bag that compromises your safety. Traveling should be rewarding. And this is exactly why you need a bag that gives you peace of mind in all aspects. Mountaintop has ticked all the boxes when it comes to designing an inexpensive outdoor bag that does all of this and more. It comes with a spacious 40-liter capacity that can hold more than the average camping backpack can, plus it has a convenient rain cover that makes sure your gear stays dry in the event of a downpour. When you’re outdoors, it always helps to be prepared for the unexpected and this affordable bag has got you covered. Mountaintop has made a name for itself in designing high-quality outdoor bags that are on par with the big name brands, but at a fraction of the price. Their line of camping backpacks cater to the needs of discerning outdoor enthusiasts: quality and space, as well as thoughtful and ergonomic features all while being extremely affordable. 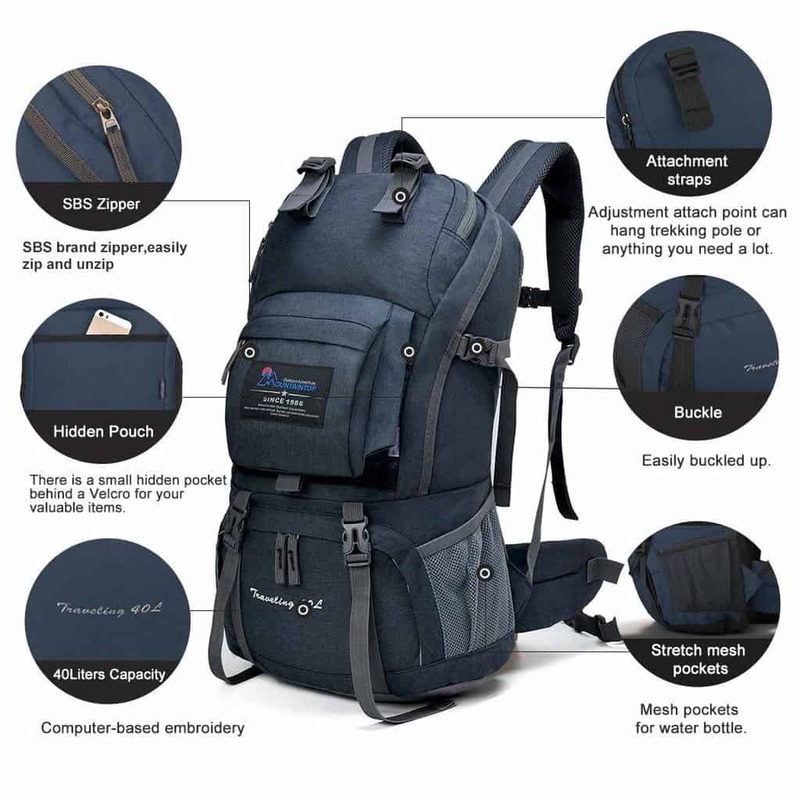 With all of its world-class features, this Mountaintop Backpack is an excellent choice that can take you places without worry. The Mountaintop 40L Hiking Backpack is perfectly made for camping: it has all the space and pockets that you need. Then there are the thoughtful shoulder straps that allow you to carry much more without taking up space from the main compartment, whether you need to attach a hammock, pack up your sleeping bag, take a yoga mat or other gear with you, it has a strap just for that. Many users have written about its neat organizational features. Its nifty zipper lets you access essentials stored in the main compartment while ensuring it’s still kept tight enough that your belongings won’t spill over. The front part of the bag has a small, hidden pocket where you can stash your valuables such as mobile phone and credit cards while adding a layer of protection to your trip, because it can’t be seen or accessed by potential thieves. The numerous exterior, front, and side pockets make organization a breeze, too! There were also a significant number of reviews from people saying how happy and surprised they were that using this bag didn’t even feel like they had it on at all. 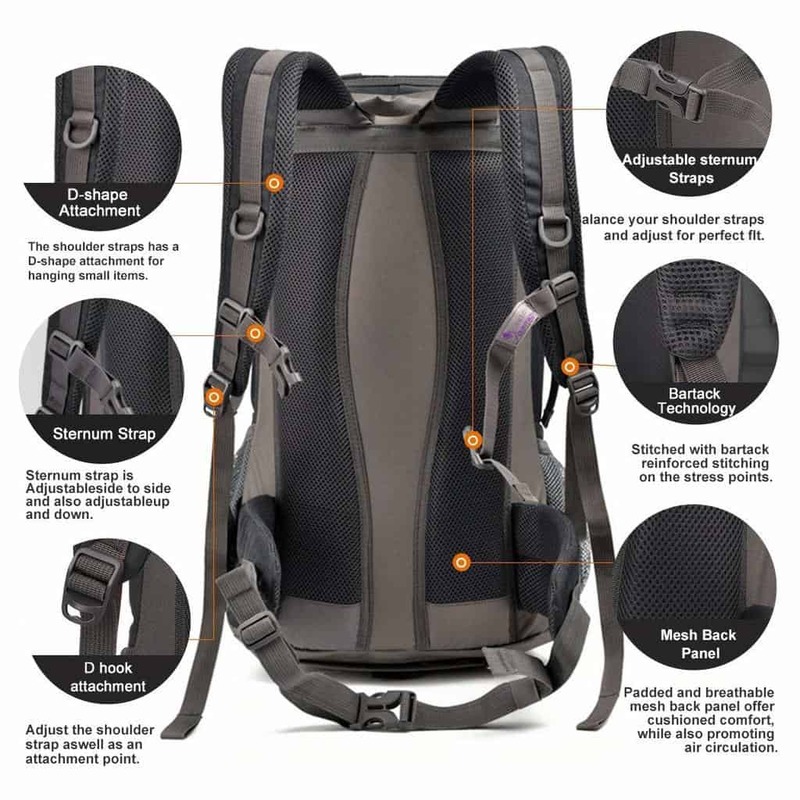 Even if you maximize its weight capacity, the thick padded shoulder straps and its adjustable hip belt allow you to carry and adjust your pack for maximum comfort. 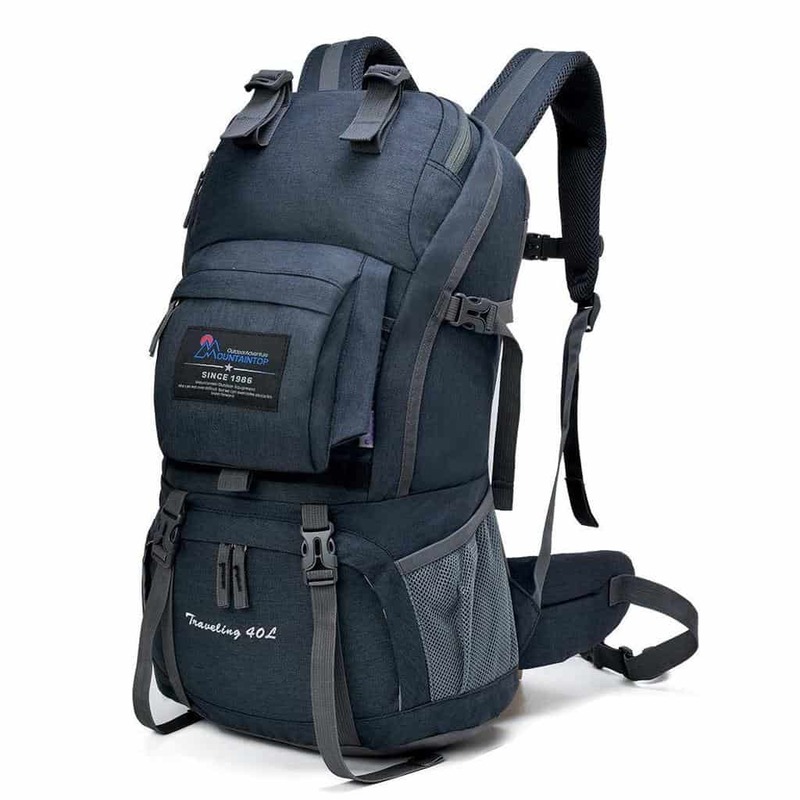 The Mountaintop Traveling 40L Backpack surpassed expectations on comfort by users who underwent strenuous modes of traveling including daily hikes, long walks, and bus rides frequently. While most users were pleased with the spacious 40L capacity of the bag, some found it inadequate for backpacking. Unless you’re willing to reuse your outfits or use the laundry, not having access to these facilities on a trip would mean that this bag has just the right amount of space for four or five days. The Mountaintop 40 Liter Hiking Backpack is available on Amazon at a terrific price. More people are discovering just how good its quality is all while being easy on the pocket, so make sure to get it while you can. Given the great low price of the Mountaintop Backpack, you may even want to consider giving it as a gift to your outdoor-loving family and friends! Mountaintop is also offering a great 90-day warranty on this bag, so if for any reason you aren’t happy with it upon delivery, then just let them know. This Mountaintop Backpack is a steal. It has all the features that high-end outdoor bags in the market offer for outdoor enthusiasts, but they manage to deliver it at such a good, low price. When it comes to capacity, comfort, and organization, it doesn’t get any better than this.